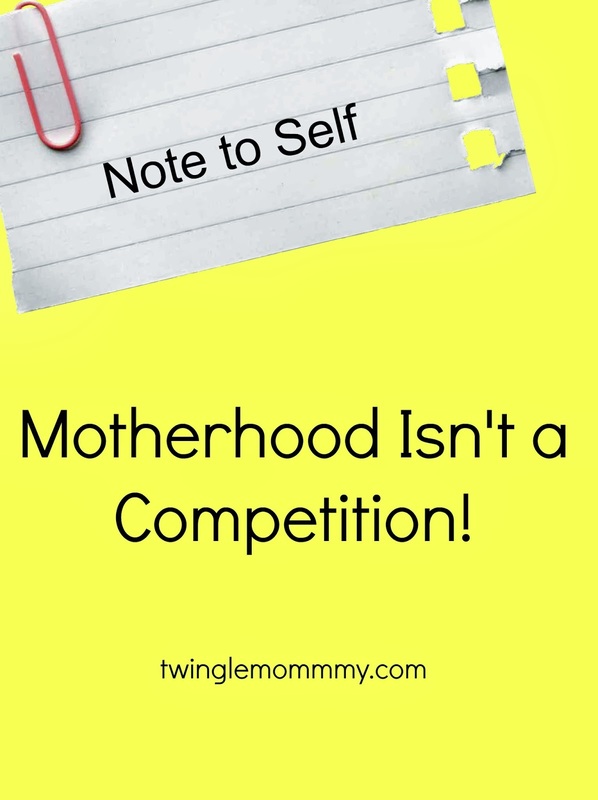 I’m climbing up on my soap box today about motherhood and competition and why they shouldn't coexist. For those of you who don’t know I had a daughter and 21 months later I had boy/girl twins. I joined the local Mothers of Multiples club right after my twins were born. I needed to be around other women who understood the unique parenting adventure that is raising multiples. About 95% of our club members had their twins first. I love my fellow twin moms but sometimes they get very competitive over the fact that they have twins. One thing that irritates me is when twin moms complain about how easy it would be to just have one child. Usually this would happen after seeing a mom struggling in a store with one kid or when a friend with one child would confide in them about what a bad week they’re having. Their comments usually sounded like the following. Oh please, she has one kid! One kid would be so easy. How can she be stressed, she only has one child? Give me a break, taking one kid to the store would be a piece of cake. Why are people helping her, she just has one kid her husband can help her. Now some of you who are reading this are probably thinking, well yeah two kids are harder than one. Trust me, it is! I know firsthand since I had a singleton first. But the real issue here isn't whether twins are harder than singletons, it's why can’t any mom have a bad day? Why do so many mothers feel the need to belittle a fellow mom just because they think they have it harder? This doesn't just apply to twin moms, it applies to all mothers. The bottom line is that we all have struggles. There are single moms who aren't getting any help financial or otherwise from their ex. There are special needs moms. There are moms who lost a child. There are mothers who have 4+ kids. There are moms who are working two or three jobs to make ends meet. There are moms who are sick or have a spouse who is sick. The list goes on and on to describe the struggles that come with motherhood. I know there are moms out there who have it much harder than me and guess what; that fact doesn't make my life any easier. We don't need to compete with each other, we need to get on the same page and support each other. If you see a friend struggling with motherhood, reassure her that you've been there too. Let's face it, no matter what card of life you are dealt, every mother feels overwhelmed at one time or another. I don't know about you, but I need compassion not competition when the days are dragging me down and I feel like I'm failing. The last thing I need is to be told that my problems aren't as bad as someone else's problems. Everyone has good days and bad. Why can’t we just acknowledge that motherhood is hard no matter what hand you are playing? Thanks for sharing. It's so important for mothers not to judge each other. As the saying goes, "Your judgement of another says nothing about them only you." I'm a mom of 4, I don't look at a new mother and say, "Boy she has it easy." I look at her and understand her struggles and joys, simply because I've walked that road once before. Empathy is a critical requirement in helping mothers and women in general maintain and develop the bonds necessary for us all to succeed in life. Great article. No one gains anything with this type of comparison. We need more compassion and less competition! I LOVE this post. It doesn't matter if you have one or one hundred children. You'll have your own levels of normal and you'll have your own struggles. It doesn't necessarily mean that your struggles are better or worse than someone else's. It just means that they're yours. Good thoughts to live by! Everyone handles things differently! I think there are certain parenting situations that are easier than others. But that doesn't mean they are easy in and of themselves! 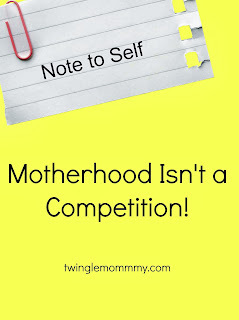 Motherhood is not easy, and yes we cannot compare ourselves with ourselves or compete with each other. Every mother has situations peculiar to them. We should rather encourage one another. Parenting is hard, period. Whether you have one child or six, it's a challenge. We're all just trying to make it through another day, and I think as Mothers it's important to face up to that rather than wasting time and precious energy being "better than" or "worse than" someone else. This is great! Thank you for sharing your heart! I also have twins and I myself have said those things that were mentioned in the beginning and you are so right about twin moms like me who look at moms with 1 child and think that is so easy, but everyone with children it can get hard, no matter how many you have. Great post!